The location is Tromsø, Norway. 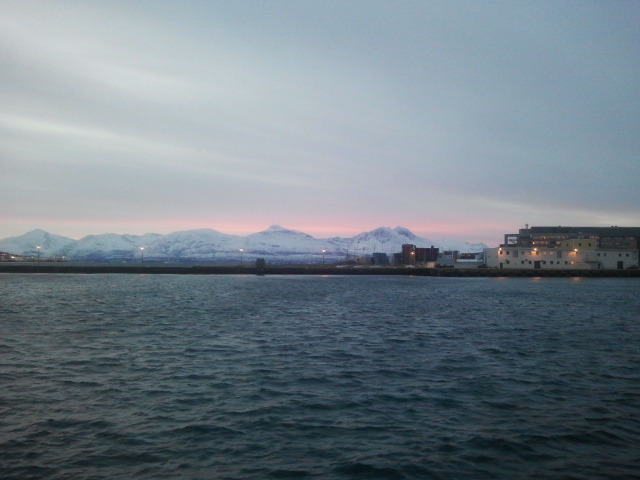 I was there the last few days to discuss the effect of climate change on arctic fisheries. Interestingly, this effect is not necessarily negative – for the Norwegians, that is. Stocks like mackerel may move northwards, making more mackerel available to Norwegian fishers at the expense of more southern less northern fleets (like the Dutch). Other effects may be that arctic stocks become more productive, and as stocks get larger they can also be found in places where they weren’t before. So the University of Tromsø gathered together fisheries economists from Norway, Denmark and Iceland (adding a stray Dutch aspiring fisheries economist and a Mexican professor) to discuss what the economic effects may be, where these effects take place, and how economists can analyse these effects. Much of the research in this domain is descriptive: what is happening, and what may happen in the future? This concerns issues varying from what fishers do, where they will fish and how intensively, to the willingness of countries to cooperate in fisheries policy when stocks move northwards. Prescriptive research – which routes should be kept open, where should marine protected areas be allocated – is scarce. I was one of the few participants presenting such research, and even that was about Vietnamese mangrove forests (not exactly arctic) and Dutch agri-environment schemes (not exactly marine or arctic). Juan Carlos Seijo had a very nice presentation about where to allocate a marine protected area in an ecosystem where the commercial fish originates from a particular (nursery) area. Not very surprisingly, one should protect the nursery area from fishing, but if you take into account what fishers do the effect of the allocation also depends on whether the nursery lies close to the fishing port or far away from it. Norwegians are delightfully unapologetic about hunting and whaling. I can’t blame them: they have plenty of fish, minke whale and game, and as far as I can see they manage these stocks fairly well. Meanwhile, the Dutch get squeamish about whether we should cull deer (but hunting is cruel), let them starve (which is even crueler), or risk hitting them on the highway (would you like a deer in your windscreen?). All the more surprising that the Dutch hunted whales, seals, and other cuddly arctic fauna on a large scale before the Norwegians did. Norwegian is a very efficient language. “Hello how are you today?” is “hej”; “thank you very much” is “takk”. Why waste energy on redundant syllables? Tromsø is a fascinating place. After Murmansk it is the largest city above the polar circle, and around this time of the year the sun does not rise – you get some twilight between 10am and 2pm, that’s it. The city is proud of its arctic hunters (like Wanny Woldstad) and explorers (like Roald Amundsen). But I admit I’m glad to have some sunlight again. Mapping marine economics (3): Why do we overfish? Let’s face it: it’s silly. The UN’s Food and Agricultural Organization estimates that about 30% of global fish stocks could have higher yields if they were fished less intensively. Think about it: spend less fuel, labour and capital on fishing, and catch more fish, not less, as a result – what’s not to like? So why are these stocks overfished? It’s the diagnostic question: what are the economic drivers of natural resource depletion? In fact, it’s one of the oldest questions in the profession, and the answer is also one of the oldest concepts: the tragedy of the commons. The ecologist Garret Hardin introduced this term in Science in 1968, illustrating it with an example of a pasture commonly owned by several herdsmen. For each herdsman gaining an extra sheep will reap benefits available to that herdsman alone (wool, meat), while the costs are borne by all herdsmen (less grass available for other sheep). The result: too many sheep, too little grass. If the pasture were privately owned by one herdsman, this herdsman would reap all the benefits and suffer all the costs, so he would probably have a smaller herd of sheep than in the commons case. The argument also applies to the fishery: the benefits of catching one fish go to the fisher catching it, whereas some of the costs (the loss of the offspring this fish could have produced) are borne by all fishers. In fact, fisheries scientists were already aware of this when Hardin published his article. The economist Scott Gordon showed in the Journal of Political Economy in 1954 that an open access fishery will be fished at a much higher rate than optimal. Note the dates here: the most fundamental insights in this domain were introduced more than 40 years ago. Has nothing happened since? Of course the insights have been refined further, and there is a lot of game theoretic analysis happening that you could interpret as diagnostic research. When do countries cooperate in international fisheries policy – and when don’t they although they should? What is the bargaining position of a single state (say, Mauritania) in establishing the access fee of a long-distance fishing vessel? But the more intriguing, and growing insight is that many commons, in Hardin’s definition, are actually managed quite well. The political scientist Elinor Ostrom (who sadly passed away this year) has described many examples of common property (water resources, grazing land, and so on) where the single user refrains from increasing his or her individual benefit at the expense of other users. Even worse: there are examples of such resources where the trouble really started when the government intervened, assuming it needed to solve the commons problem! So what happened here? It seems (and I admit with some embarrassment that it always takes a non-economist to remind economists of this) human behaviour is driven by more than a calculated self-interest. Many common pool resources are shared by people who are friends or relatives of each other, their kids play with the kids of other users, or their older children may marry those of other users. Ostrom’s research showed that many communities of common pool resource users have developed rules of what they consider ‘reasonable’ use. Use more than your fair share, and you will have to explain yourself to your in-laws, your neighbours, and so on. The rules lead to a management that may not be strictly optimal, but it is certainly sustainable, and probably better than the Tragedy described by Hardin. And when governments introduced legislation to govern the use of the resources, this legislation conflicted with the older informal rules, making matters worse rather than better: formal rules have a nasty habit of crowding out informal rules. So what should marine resource economists do with these new insights? It’s a difficult subject. So far the research into the role of social norms and informal rules has been very descriptive, with very few insights that can be generalized to the majority of cases. I know a few economists who try to understand how these informal rules evolve: surely a society that has developed the wrong informal rules eventually destroys itself. So you can model this evolution in a manner similar to how ecologists apply game theory to the evolution of species. But how much of that research yields insights that we can apply today remains to be seen, and I’m no evolutionary economist. Therefore, the research I’m doing in this domain will probably remain limited to a few game theoretic analyses. In VECTORS we analyse how fishing treaties between EU member states (and non-EU countries like Norway) may collapse when stocks move northward with their preferred climate zones. (Actually, Adam Walker is doing this with Hans-Peter Weikard.) In BESTTuna we will analyse the bargaining position of Pacific island nations, and their willingness to cooperate in a common tuna fisheries policy. Hopefully this research will tell us more about the possibilities and impossibilities of managing cross-boundary fish resources through international treaties. Is it (according to Web Of Knowledge, that is) “Environment and Development Economics” but “Environmental & Resource Economics”? Do publishers offer fancy templates for LateX files that violate their own journals’ guidelines for authors? Indeed, why abbreviate journal titles at all? How bad is our current state of coastal and marine resources? This question may get you browsing the websites of IUCN, Wetlands International, or other NGOs, looking for data on historical trends in coral reefs, endangered fish species, and so on. But whether and how fast coral reefs disappear is only half the answer to this question. Note that the question asks: how bad is it? So when we know the rate at which coral reefs are disappearing, the next question should be: how bad is it that they are disappearing? It’s what I call the nasty question: why do you want to protect the environment? The question sounds insulting, criminal even, as it seems to ignore a self-evident fact: surely the environment deserves protecting? But ‘protecting the environment’ can mean many things, ranging from eliminating emissions of substances that cause cancer (good) to saving the smallpox virus from extinction (not so good). I wrote in an earlier post that given the choice between tsetse flies and human beings, my sympathy is with the latter. In other situations, however, the choice is not so clear. Conserving sharks may sound like a laudable goal, but how many lethal shark attacks are we willing to accept? There are many such trade-offs in coastal and marine policy: mangrove conservation versus shrimp farming, wind energy versus fishing, port development versus tourism. We can’t escape making explicit in what ways, and to what extent, ecosystems are important to us. And so on. (Edward Barbier has written a very nice overview of the goods and services provided by coastal ecosystems. Best of all, it is free!) What economists do in this kind of issues is estimating how much coral reefs, mangrove forests, marine fisheries systems, and so on, contribute to human welfare – and yes, we try to express that contribution in dollars, euros, or other currency. This is done for two reasons. The most-cited reason is that if we don’t make these estimates, policy makers may assume the economic value of such ecosystems to be zero. Although I see the merit in showing the importance of coastal ecosystems in a way that makes it possible to compare this value to the value of, say, laptop computers or refrigerators, I still see a danger that such ‘raising awareness science’ degrades into advocacy. In my view, the most legitimate reason to express the value of ecosystem goods and services in monetary terms is that big public projects, like development of ports or aquacultural areas, need to be appraised by the best information available. That means that a cost-benefit analysis of such projects should consider not only the costs of building the port and the income generated by using it, but also the effect it will have on, say, the damage suffered when the next tsunami comes along. A lot of work has been done in this respect, and a lot of work still remains, as Barbier’s article demonstrates. But I’m not going to do it. I have done valuation studies in the past, and occasionally I supervise students doing valuation surveys. But if you want to really make your mark in this domain you need to do nothing else, and I’m too much of a modelling person to focus on surveys and the statistics that go with them.